The last time it happened was in 1888. Chanukah and Thanksgiving…..at the same time! Some might call it “Thanksgivukkah.” But whatever you call it, you can be sure that it won’t happen again for tens of thousands of years to come. This year American Jews may be enjoying crispy, hot latkes with their Thanksgiving turkey. Sounds like a delicious combo to me. Yummmm. Yet, despite this year’s rare opportunity to celebrate a double dose of survival and gratitude, some things will always remain the same. The Story of Chanukah reaches back in time way past the struggling Pilgrims on New England’s rocky coast. It reaches back to 167 BCE when the Syrian king Antiochus desecrated the Temple and outlawed Jewish practices. The five sons of the Jewish priest, Mattithius, were incited to revolt. Chanukah celebrates their victory and the miracle of the light that lasted for eight days during the Temple’s re-dedication. 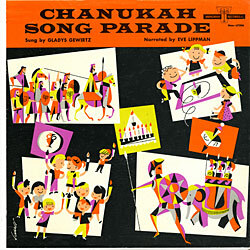 This year the Judaica Sound Archives has created a special Chanukah Sing-a-long video featuring one of the songs sung by Gladys Gewirtz from Menorah’s “Chanukah Song Parade” album. Menorah Records which produced phonograph recordings during the 1940s and 1950s was a pioneer in producing recordings for Jewish children.